In June 2017, I was invited to the Massachusetts Institute of Technology in Boston to present my project and previous research, which results in fruitful future cooperation. Also, I cannot thank enough A. Allanore and his team of the Allanore group for the invitation, their warm welcome, and the fantastic days I spent at the MIT! July 2017. The color characteristics of different copper alloys of particular interest in archaeometry (CuAs, CuSn, CuSb, CuNi) are investigated quantitatively and systematically. By using the CIELAB color system, different color parameters such as a*, b*, and L* were measured by a spectrophotometer in order to describe the surface color. This permits the establishment of a set of color-composition diagrams, demonstrating clearly the connection between chromaticity parameters and alloy composition. The article, which has as co-authors Daniel Berger and Maikel Kuijpers, was recently accepted by the Journal of Archaeological Science and will be hopefully published soon. In April 2017, I have been at the 21st international GMPCA conference in Rennes, France, listening to a lot of very interesting papers. The conference is THE conference for ‘archaeometrists’ in France and a fantastic opportunity to meet colleagues and researchers of all fields of archaeometry. Together with Benjamin Sabatini I presented a poster on Chemical and metallurgical aspects of arsenical bronze: inverse segregation in prehistoric Cu-As objects. You can find the poster for download here. After annealing and deformation of a lot of samples, I am busy with polishing (November 2016). Polishing of a lot of samples. Also, the next article on ‘Arsenical bronze: a constant out-of-equilibrium’ is almost ready for submission. Further articles on the loss of arsenic during recycling activities, and on the colour of arsenical bronze, are in preparation. Thanks to Benjamin Sabatini, who made me aware of this very kind complain about bad quality copper, and misbehaving merchants in Ur. The complaint is from around 1750 BC. I would like to know about something similar mentioning arsenic too! Clay tablet; letter from Nanni to Ea-nasir complaining that the wrong grade of copper ore has been delivered after a gulf voyage and about misdirection and delay of a further delivery (© The Trustees of the British Museum. Museum number: 131236). When you came, you said to me as follows: “I will give Gimil-Sin (when he comes) fine quality copper ingots.” You left then but you did not do what you promised me. You put ingots which were not good before my messenger (Sit-Sin) and said: “If you want to take them, take them; if you do not want to take them, go away!” What do you take me for, that you treat somebody like me with such contempt? I have sent as messengers gentlemen like ourselves to collect the bag with my money (deposited with you) but you have treated me with contempt by sending them back to me empty-handed several times, and that through enemy territory. Is there anyone among the merchants who trade with Telmun who has treated me in this way? You alone treat my messenger with contempt! On account of that one (trifling) mina of silver which I owe(?) you, you feel free to speak in such a way, while I have given to the palace on your behalf 1,080 pounds of copper, and umi-abum has likewise given 1,080 pounds of copper, apart from what we both have had written on a sealed tablet to be kept in the temple of Samas. How have you treated me for that copper? You have withheld my money bag from me in enemy territory; it is now up to you to restore (my money) to me in full. Take cognizance that (from now on) I will not accept here any copper from you that is not of fine quality. I shall (from now on) select and take the ingots individually in my own yard, and I shall exercise against you my right of rejection because you have treated me with contempt. See the tablet at the British Museum here. Finally, the project’s first article A Re-evaluation of inverse segregation in prehistoric As-Cu objects is out (others will follow soon). It’s published in the current issue of The Journal of Archaeological Science. The study revaluates reported cases of prehistoric As-Cu objects with ‘silvery surfaces’, which are usually interpreted as the result of inverse segregation. 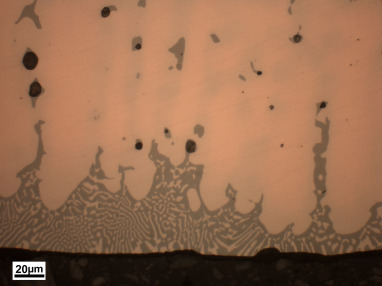 Further possible explanations for such surfaces, such as an arsenic-rich alpha-solid solution, cementation, or post-depositional precipitation, are discussed. The segregation of arsenic was studied in As-Cu ingots produced in chill cast moulds at several compositions, which underwent surface treatment with an NaCl solution. The microstructure and surfaces of the As-Cu alloys were analysed using optical microscopy and SEM-EDXS. Special note of out-of-equilibrium As-Cu phases are discussed, as well as a comparison of inverse segregation to all other means of achieving surface silvering. In September/October 2016 I was busy with preparing roughly 300 samples for the data base and the hardness measurements. Samples were made of eight different alloys, four different annealing times at 600°C in reduced atmosphere, cross-section and longitudinal section, and up to five different grades of deformation (cold rolling). And I have to admit that the rolling machine is just fantastic! The more arsenic the alloy contains, the harder it was to roll (not very surprising…) but I was fascinated by the squeaky sound the higher alloyed metal produced. Some of the prepared samples. The DTA analyses started in February 2016 are finished in May 2016, and an out of equilibrium phase diagram for the Cu-As system up to 15 wt.% arsenic was established. One of the characteristics of the diagram is also the appearance (even below 2 wt.% of arsenic) and temperature changes of the (α+γ) eutectic. I am currently preparing the article, which, once accepted, will be posted here. I noted also some losses in arsenic, which are mainly the result of adding the arsenic lump to the molten copper. Recently started analyses with the DTA-TGA instead show significant losses of arsenic when melting the alloy, and less once it is cooling down. I am thrilled to see more results and curves, and to figure out how to connect them with the loss of arsenic during prehistoric recycling activities! Arsenical bronze with 11 wt.% arsenic after cooling down with 20 K/min. Note the inverse segregation at the edge, and the massive appearance of (α+γ) eutectic. Following an invitation of the University of Cork, I was able to visit the Ross Island copper mines beginning of March 2016. In February 2016, first DTA tests were carried out with CuSn alloys to be certain that the protocol of investigation works and the alloy to be studied is not going to contaminate the DTA. For the analyses, a NETZSCH DSC 404C was used. The alloys (CuAs with 3, 4, and 5 wt.% As) were sealed in tantalum crucibles in Ar atmosphere. First cooling rates were fixed at 2, 5, 10, and 20 K/min. With the selected alloys we still remain in the range of the Cu based alpha solid solution. With the 2K/min cooling rate no eutectic transformation was noticed, which is coherent with the equilibrium phase diagram. 4 and 5 wt% As show already at 5K/min and 10K/min signs of eutectic transformation, which happens at lower temperature than in the phase diagram. The measurements at 20K/min are missing for CuAs-3 and will be re-measured. The measurements for the alloys with 1, 2, 6, and 7 wt.% As are currently carried out. Further analyses are planned with 8, 11, and 19 wt.% As, in order to achieve a complete set of data to draw the liquidus curve and the interception with the eutectic line. October 2015: L’Institut de recherche en archéomatériaux – Centre de recherche en physique appliquée à l’Archéologie (IRAMAT-CRP2A) propose un séminaire autour du thème “Chemical and metallurgical aspects of arsenical bronze: the case of arsenic-loss in prehistoric metal production“, présenté par Marianne Mödlinger, titulaire d’une bourse Marie Curie. Il aura lieu le 23 octobre 2015, 12:30 à Pessac (salle Archéométrie du CRP2A). Over the last weekend (September 2015), I burnt the clay moulds and tested them with CuPb and CuSn last Monday. Unfortunately they broke during casting. So this means back to the start, and redo the moulds – this time with tempered clay and some hay, which makes the mould also much closer to the ones we know from the Bronze Age! The sandstone moulds are in preparation as well; I also started with the first sand casts. In order to study the loss of arsenic during prehistoric recycling activities, I started with the first casting experiments in July 2015. A 5% arsenical bronze ingot with 250g was produced (see image on the right) and re-cast already several times. Graphite crucibles were used both for casting and as mould. The bronze was melted in a small furnace in reduced atmosphere and cast at 1110°C. Thus, As is lost only during the casting process itself and the cooling down of the alloy. Once cooled down, the crucible containing the bronze was placed in the oven at 1110°C and recast in another graphite crucible. The loss of arsenic was noted by white fume for about 1 min after the cast. In a few days I will have a look at the samples with the SEM-EDXS… looking forward to it! The annual conference of the European Association of Archaeologists (EAA) will take place in Glasgow, UK in September 2015. Together with P. Bray, A. Cuénod, and C.N. Duckworth, I organise a session on ‘Recycling things and ideas: linking scientific, archaeological and conceptual approaches to the reuse of materials in the past’, which will certainly result in valuable new ideas, discussions and approaches. Recycling touches upon all aspects of archaeology, but it often suffers from its perceived ‘invisibility’ in the material record. Reuse, reforming and mixing of material alters its composition and shape, and can therefore directly affect conceptions of source, provenance, technology and chronology. The malleability and reuse of material challenges simple ideas of identity, value, economy and exchange. Despite the profound effects of recycling it is often difficult to identify and quantify in the archaeological record, particularly for materials and artefact-based studies (by comparison with, for example, architecture). This means that the manufacture of objects from ‘prime’ raw materials is often implicitly assumed to be standard practice. We are also in danger on relying on modern conceptions of recycling that focus on ecological concerns and coping with scarcity. Improved communication and co-operation across a range of disciplines offers new ways to better understand the flow of materials in the past. This session aims to provide a forum for these discussions and will highlight new approaches and models. Papers will examine how lab-based science, experimental archaeology, excavation and artefact-led archaeology, and conceptual archaeology can come together to identify and quantify recycling and its effects. This will be in conjunction with considering the challenges involved in pursuing inter-disciplinary work. Further activities at the EAA will be the organisation of a round table about the Sellout of our past: different strategies of how to deal with illicit trafficking of European Cultural Heritage and a presentation on metal analyses of Bronze Age defensive armour. July 2015: Before work can begin on the arsenic bronze, all relevant safety aspects must be considered, i.e. I must ensure that the work will not harm myself or others in the lab. Reading the standard precautions for arsenic (e.g. from Sigma Aldrich) was informative if not a little scary. Full respiratory equipment (e.g. full face particle respirator type N100 with appropriate cartridges and filters), a disposable complete suit protecting against dust and particles, and gloves will be worn as a precaution to ensure personal safety in the event of a toxic arsenic oxide vapor release during the experimental work. The experiments will be performed under an extractor hood equipped with adequate filters in case any leakage occurs. The reactor consists of a crucible or a quartz vial sealed with a consumable glass / quartz pipe. The pipe is shaped to cool the vapours from the reactor and direct them into a container (e.g. a beaker) where a basic water solution will receive and fix the As-rich compounds in a stable arsenate salt. The glassware and the arsenate-rich solution will be stored as hazardous waste in secure gas and watertight containers and disposed of correctly by a licensed company, together with the laboratory gloves, coats and filters. Read more about the physiologic effects of arsenic exposure here. The core idea of this project has been in development for a very long time – by now, it must be over 10 years. While writing my PhD about European Bronze Age swords I came across the article of McKerrell – Tylecote 1972 and became curious about the amount of arsenic that actually remains in bronze after several (prehistoric) recycling processes. I tried to find further literature focusing on this but apart from the article of Lechtman 1996, the unpublished PhD-thesis and some hard-to-get articles of Paul Budd, as well as the article of Northover 1989, not much seemed to have been done until around 2005. In the meantime I focused on other topics: I finished my PhD, documented Bronze Age weapons and tools in the Baltic States, then moved to Carinthia and started to work at the local Landesmuseum. Amongst other things, research projects of the Austrian FWF, CHARISMA and Marie Skłodowska-Curie actions subsequently permitted me to study and analyse e. g. European Bronze Age body armour at the Laboratorio di Metallurgia e Materiali in Genoa. However, I remained intrigued by the loss of arsenic during prehistoric smelting and melting. Every time I saw diagrams in archaeological publications linking the amounts of As, Sb, Ni and Ag together in order to locate geographically a copper mine, I had the Ellingham diagram of the formation of common metal oxides in mind, noting that arsenic (as well as Sb) is far from being as stable as these publications sometimes would lead one to believe. A literature study at the end of 2014 indicated that even up until that point, no further experiments had been published. However, recent studies carried out by M. Pollard, P. Bray and A. Cuenod demonstrate the importance of arsenic as a marker for the intensity and / or number of recycling activities in the Bronze Age, and how it may indicate direct or indirect connections between the owner of the final object and the mine(s) where the copper was originally produced. In addition, thermodynamic studies on CuAs are now close to being published (B. Sabatini). Starting with a project to investigate the construction of out-of-equilibrium phase diagrams of Cu-As, to evaluate mechanical properties and characteristics of arsenical bronzes and finally, to quantify and evaluate the loss of arsenic as it occurred during prehistoric manufacturing processes, will certainly be a challenge – scientifically as well as for health reasons, since arsenic is not really famous for its positive effects on one’s health. Ultimately though, I am thrilled that from July 2015 on I can finally start to work with arsenical bronze after all these years – and especially to have the opportunity to carry out this project at the IRAMAT-CRP2A at Bordeaux in cooperation with the LMM at Genova! In April 2015, prior to the project’s official start, I was already able to present my ArsenicLoss project ideas and work plan at the ‘Glass and Metal Recycling in Archaeology and Archaeometry’ workshop at the University of Leicester, UK. The workshop was kindly organised by A. Cuénod and C.N. Duckworth (a warm thank you to both for everything!) in the frame of the ERC-funded Trans-Sahara project. This workshop and the associated discussion possibilities provided valuable hints for the experimental set-up and laid the groundwork for cooperation with other colleagues.